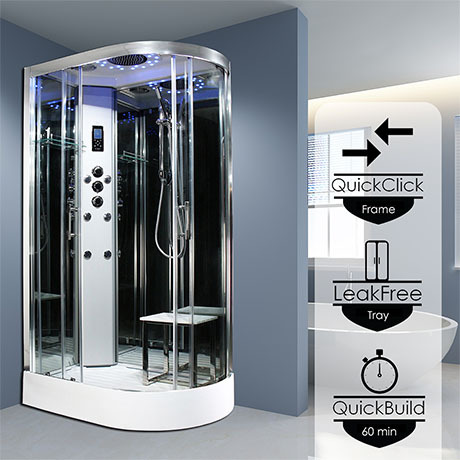 This top of the range Insignia Platinum shower cabin is yet another magnificently crafted model in our 2nd generation leak free and fast build showers. The slender 1100mm x 700mm complements any bathroom design, especially en-suites where luxury couldn’t have previously been thought possible. Designed for those who want something special, this shower cabin has an abundance of features for you to indulge in. The luxurious stainless-steel monsoon rain shower engulfs you in complete water immersion. Alternatively, you have the baton style brass hand shower, available on an easy to use riser rail for optimal height setting. Want to sit and relax? It’s easy with the white wood effect seat and soothing body jets. The luxury continues with Insignia’s 2nd generation Bluetooth touch control, operating your own music and multi-coloured internal lighting, with the power being at your fingertips. With this 2nd generation platinum level, top of the range shower cabin you own Insignia’s leak free tray design, bespoked to your choice with the myriad of features mentioned. Showering perfection for your bathroom and you know why? Because Insignia know you are worth it. Designed by you, built by Insignia.